The Children of Willesden Lane Bay Area BIG READ is a powerful education initiative for grades 6-12. It teaches youth about the Holocaust, the importance of standing up against bigotry and hatred, and the transformative nature of art. 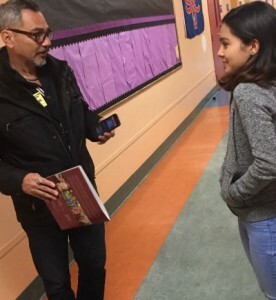 Recently, KCBS reporter Scott Lettieri visited a classroom at City Arts and Technology High School in San Francisco where teacher Allison McManis is engaging her students in the BIG READ. 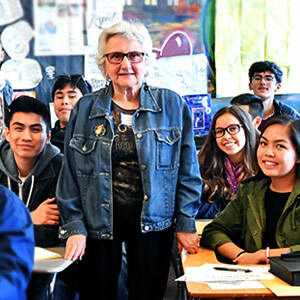 Many of her students have connected the themes of The Children of Willesden Lane with issues in our own time, drawing comparisons to the struggles of refugees past and present. Many students agreed that learning about the Holocaust from the perspective of one teenager allowed them to connect to the history. “You look at one person’s story and from there you can see how other people related to it,” stated one student. The program included a book and classroom activities, and culminated in an award-winning theatrical production by concert pianist and acclaimed storyteller Mona Golabek about how the power of music helped one young woman survive the Holocaust as a refugee. The performance is based on her book, The Children of Willesden Lane. Performances took place November 7-10, 2016 at Herbst Theatre in San Francisco.